Residential Solar Systems Blowing Up! Danny Kennedy, founder and president of Sungevity, was recently interviewed by Bloomberg TV. Most of the questions were about residential solar energy in the US in general. Danny knocked the ball out of the park so many times that I think someone should check to see if he’s on steroids. He was tremendous. He also notes that the solar leasing industry has grown from a billion-dollar business in the US last year to a couple of billion dollars in 2013 and probably a 5-billion-dollar business within a couple of years. Great stuff. Excellent answers. It’s one thing to know all these things, but it’s another to be able to provide such excellent answers on the fly, including the wonderful statistics and dates Danny didn’t even have to search for. I keep wanting to write something else about it all, but then realize that Danny nailed almost everything in a perfect way. Aside from the above, he also nailed one of our big points of emphasis, that solar panel costs have come down from about $4/watt five years ago to about 75¢/watt today, a tremendous cost drop. Every doubling of volume has resulted in a 20% reduction in price. And the cost of residential solar systems has thus come down to a large degree as well. 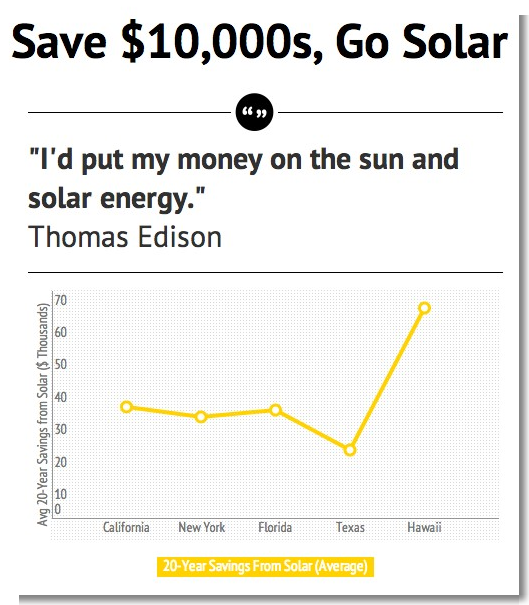 Solar power costs have dropped tremendously in the past several years. Nonetheless, we’re at the beginning of a tremendous exponential growth curve that is going to see the solar power market blow up — we’re going to see a transition to solar similar to the transition we saw to cell phones, or to smartphones. The solar revolution is here! !